This disc was auctioned by It's Only Rock & Roll in early 2005 and, surely, would be identical to the released version. 1971. For the serious Beatles vinyl collectors, this is a fantastic lot. 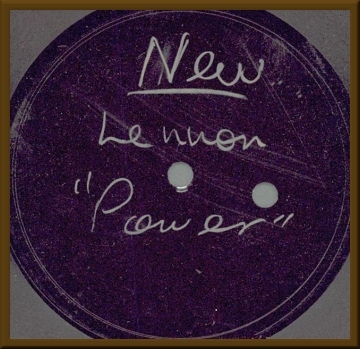 Included is a 7” vinyl plain white label test pressing of “Power To The People/Open Your Box”. This is a U.S. pressing of a single which was not released in the U.S. “Open Your Box” was the U.K. “B” side. In the U.S., it was “Touch Me”. Matrix numbers are S-45X-46492 Z5 and S-45X-46493 Z5 with Bell Sound logos. Included with it is a (torn) typed letter on Capitol Records stationery which indicates that the test pressings have “narrow lateral groove width” and may not track properly on “a marginal commercial phonograph”. The label of the “B” side has “skip at 3:10” written in ink on it. However, after playing it twice, we encountered no skip. It does have a minor warp, not affecting play though. The other item included in this lot is a 10” unlabeled metal acetate of the same coupling and Sam’s handwritten EQ notes for it. Discs VG++.